Not All Those Who Wander Are Lost: Ain't she sweet?! 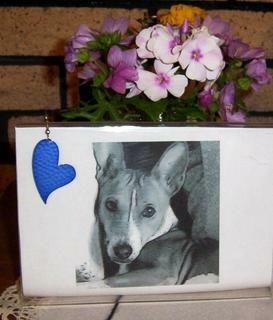 This is a picture of a photograph I took of my Basenji, Dream, a few years back which I redid as a black and white photo, and the flowers are some of the last blooms here at Wine Brook Cottage that Heather picked to bring inside. The flowers are Phlox and Musk Mallow with a Jerusalem Artichoke. The Phlox have the most wonderful perfume. How I wish I could box that up for the long winter ahead. Summer does seem to be winding down, doesn't it? Looking forward to long winter days spinning by the fire, but I'll miss the scents of summer!